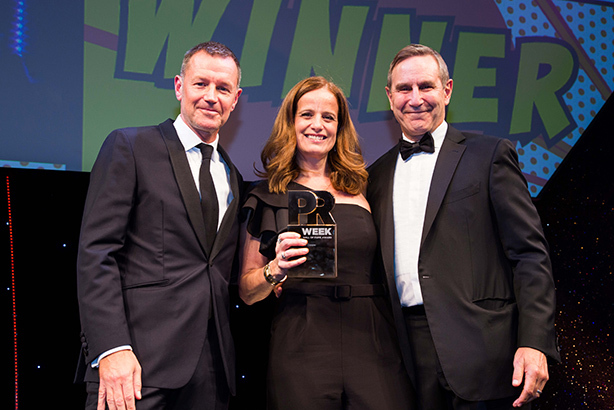 Cooper, who has been global creative chair at Edelman since 2013, was inducted by the firm’s chief executive Richard Edelman on Tuesday evening at the PRWeek UK Awards. The annual event at Grosvenor House in London was attended by 1,000 industry leaders from client organisations and consultancies. David Brain, who acquired JCPR in 2004 while CEO of Edelman Europe, told PRWeek: "It sounds so trite and obvious now, but Jackie made creative important. "Ten years, let alone 20 years ago, there were precious few creative directors in the PR world and almost none had Jackie’s seniority and cut through. Everyone she worked with knew that each pitch, proposal and programme had to have a proper big idea based on a sound insight. Creative was always part of the JCPR culture, but it quickly became so at Edelman, too." Cooper, with her business partner Robert Phillips, set up Jackie Cooper PR in London in 1987, and they ran award-winning campaigns including the launch of O2, for Allied Domecq, Wembley Stadium, Wonderbra and Playstation. After being merged into Edelman in 2004, Cooper then served as creative director and vice chair of Edelman UK, where she provided strategic counsel on campaigns including Dove’s Campaign for Real Beauty and Every Child has the Right to Play for Omo for Unilever. In 2011, she was appointed global vice chair for brand properties, working on Diageo, Starbucks and Microsoft accounts. In the past two years Cooper has overseen the hire of 500 creatives, planners, art directors, producers and copywriters to transform Edelman’s creative firepower. Cooper said: "I feel humbled and really, really bloody proud of all that I have achieved with JCPR and at Edelman, where I have worked with colleagues every day who want to make a difference. This business, those teams and the clients who allowed us to work on their campaigns have elevated my life in ways I couldn’t ever imagine when I was a young, academically inept girl!" PRWeek’s editor in chief, Danny Rogers, said: "Jackie Cooper was influential in the transformation of PR into a marketing discipline that rivals, and increasingly trumps, advertising for big brands. She is that rare mix of entrepreneur and creative force, who then made the transition to a leading role in the world’s biggest PR shop. All this while retaining a strong sense of friendship and family."